I have had a lot of questions about my eyebrows ever since I had chemo and ever since I had my eyebrows tattooed. 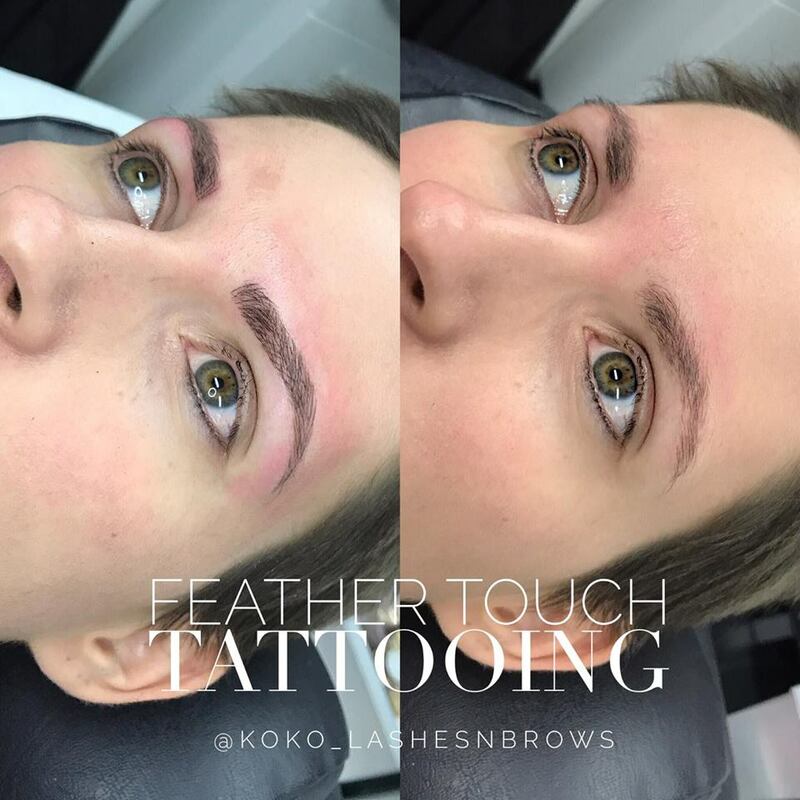 Now I say eyebrows 'tattooed' but the actual term for the procedure that I have is called micro-blading. I first had them done a week or two before I had chemo back in July, because I was terrified of having absolutely no eyebrows. My whole life I have always had very strong brows (way before it became fashionable and like most teenagers in the 2000's I spent years plucking them into basic nonexistence) but I knew that without them I wouldn't even look like me anymore. One of my sisters friends owns a beautiful eyebrow and lash bar/salon in the Sunshine Coast and she took me up there for her gorgeous friend Jade to do my brows. I was super happy with them and a few months later I had indeed lost every single eyebrow hair (and eyelash) and was incredibly glad that I had got them done when I did. Chemo took a lot from me and eventually every single hair on my body fell out and the fact I didn't have to get up and try on draw an eyebrow on with absolutely no guideline was a real blessing. The first time Jade did them for me, she had to do them a lot stronger than she would have usually because I wouldn't be going in for my touch-up, which is usually 4-6 weeks after your initial appointment and by that point I knew I would have been having chemo and not allowed the procedure. Considering I didn't have the touch up they lasted extremely well, a good 4-5 months. I went back in yesterday to get them re-done and after going through a very tough time recently, with struggling with my appearance, it has made the world of difference to how I feel and I really bloody love them. Jade gave my brows a massive tidy up, she shaped them, evening them out the whole way through. They were really stumpy to begin with, really thick and full at the front but short and thin towards the end, so they were really out of proportion. They say that the science to a beautiful face is symmetry, so it makes an amazing diffeence t just have two eyebrows that are symmetrical and in proportion. Now I know that looks don't mean anything, after what I've been through I really don't give a damn, your health is the most important thing and feeling good. But there is that little part of you that looks in the mirror and thinks 'wow, you look horrendous'. It's mainly to do with my hair, it's at a really awkward stage where it can't be styled and I hate the way it looks right now, although it's still a huge improvement on the bald head! It's just one of those things, I'm grateful it's growing back, I love that I have hair again, but I just wish I had my mane back and felt feminine again! To be fair I haven't really been looking after myself recently, it's so hot I hardly ever wear make-up because it just melts off and I've been so busy with my work that I usually just crash out after a shower or a quick face wash at night. I think I'm going to start a new skincare routine to 'unwind' at night time and hopefully stop looking so damn tired! But anyway...back to the eyebrows. They have definitely made me feel better! This post is just a little bit about the actual procedure for those who have always wondered about getting it done and also for my pink sisters that are about to have chemo or have finished chemo and whose eyebrows haven't grown back properly and my own personal experience. I am by no means a beauty expert. I finished chemo in November and luckily my eyebrows did come back pretty thick and strong within a few weeks, my lashes have grown back but they are still very short and a bit thinner than they were previously, although I've never been blessed with amazing lashes and as I mentioned before, they were just out of proportion and stumpy. Having my brows done by Jade means all the little gappy bits are filled in, she has shaped them beautifully and I don't have to wear any brow make-up on them at-all. They are still very natural looking, I didn't want to go for the Geordie Shore caterpillar eyebrow look thanks and I didn't want them to look like they'd been drawn on by a sharpie. They use a special micro-blading pen to draw on individual hair like strokes. It can be a bit painful but numbing cream is applied to the area about half an hour before-hand. When Jade does mine she draws on a guideline first which she double checks I am happy with before she begins. It takes around 2 hours for the whole thing and then you return in 4-6 weeks for a touch up.